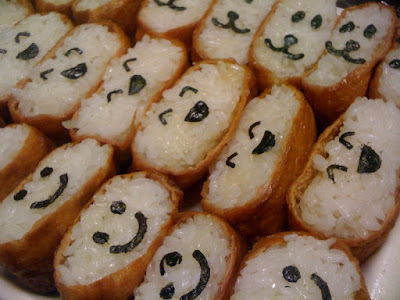 Have you ever seen those pictures of those really creative bentos? 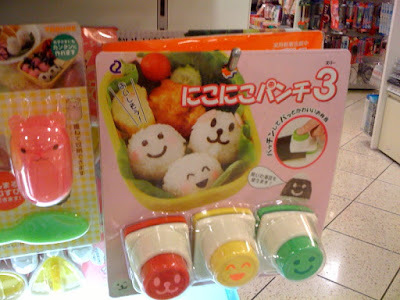 Just google "cute Japanese bento" and you'll see what I mean. 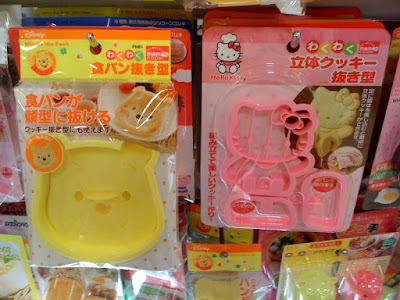 So when I happened upon the plethora of kawaii! 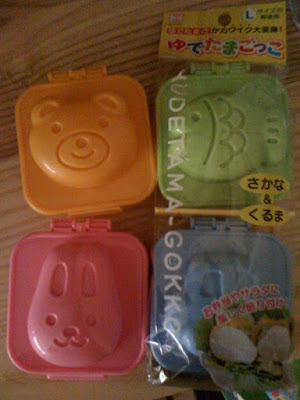 plastic goodies from Japan at Hands Tailung, I oohed and aahed and giggled. 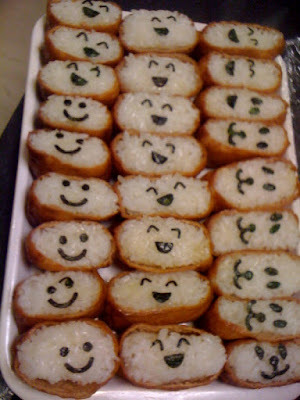 Or as you could see up top, smiley faces for your rice balls, inari sushi or whatever the heck you want. You can see which one I picked. 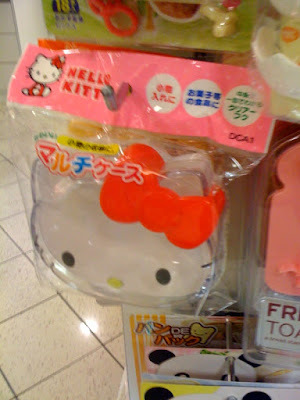 I would have bought more, but the Sogo price was a bit steeper than I would have liked to have paid. Not that creative? 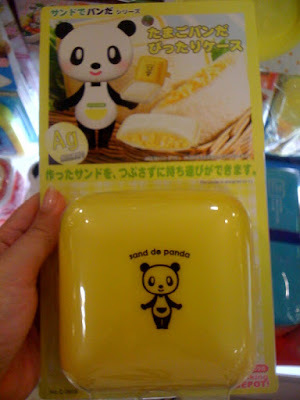 You could just put the food in a kawaii bento box and be done with it. When I was a kid growing up in Indiana and Southern California, my lunch was leftovers from dinner before, usually rice and veggies and some meat. Other kids would say, what's that? Sometimes in curiosity and sometimes in faux disgust. I remember trading nori seaweed strips for Doritos. But then I worked in my elementary school's cafeteria as a student helper in exchange for free lunch everyday and giving extra crinkle cut french fries to my friends. I ended up growing up on sloppy joes, country fried steak, pepperoni pizza lunches and 15 cent ice cream sandwiches, in addition to the fried dumplings and braised pork and mushrooms over rice my parents would make for dinner. Sure you could spend hours cutting them out by hand, but a sharp punch is much faster... Just punch, punch, punch and assemble. You could also mix and match the eyes and smiles. You could use a regular craft punch too, but I've never seen smiley face ones before. When I make the boiled eggs, I'll give it a post as well. I ended up buying these at a much cheaper price at a little discount store on ZhongXiao near Pizza Hut that I like to shop at. You can find a lot of other cute and random stuff here that you never knew you needed- browse at your own risk. Walking into Mala, I knew I was going to like it. First off, it's all you can eat and mostly self serve, so you can mull over if you want seafood, veggies, ramen or fried you tiou from the abundant wall of choices without having to wait for a server to come to your table (which sometimes takes too long at other places when they are busy pushing the vegetable cart around) or feeling guilty about piling up your plate up high repeatedly. Second, there's also all you can eat dessert- which includes not only a freezer of Movenpick, but also Haagen Daaz ice cream, which is proudly displayed at the entrance as well. Smart move, considering that a scoop or two of name brand ice cream is half the price of all-you-can-eat entry fee. If you don't want ice cream, there's also fruits, flans and cakes to choose from. Third, it was packed on a Monday night. The setting is modern and bustling- groups of friends talking over music and spicy hotpot. Don't even try to add in friends who come late like we did, as tables are allotted for only 2 hours or so and then booked through the night to other reservations. Did I mention the wall of food? It had everything and it was fresh and tasty- more types of soy and tofu than I could name, packaged ramen, shrimp, mussels, scallops, fish, fishballs, at least four types of mushrooms and lots of cabbage, chinese cabbage and vegetables. The servers were efficient about constantly refilling pans that had run out. I put half of my goodies into the non-spicy side and half into the mala side, especially the you tiao which soaks up the spicy broth and is crispy and soggy at the same time, sort of like a crouton bathed in french onion soup. I find the broths here a bit saltier than the others I've tried, as I was pretty thirsty the next morning. And there's the meat. Lamb, Black Angus beef, chicken- just ask the server and they will bring the trays of thinly sliced meat to dunk and swish and devour. To combat the spiciness, there's quite a few self serve drinks as well as Coke in glass bottles and Taiwan beer. There's also an array of soy, sesame, vinegar and chili sauces to mix and match to your own liking (though all labeled in Chinese). I recently passed the famous (and some say overrated) Tripod King in a taxi and saw the lines outside. Save yourself some waiting and a few bucks and try out some of the other Mala places in town. Advance reservations strongly recommended though! Kid friendliness: high chairs available and lots of finger foods. steak might be too chewy for some. When I was a kid, Sizzler and Todai were the two special event places to go for dinner in my family. When I was in middle school, Sizzler might have been one of my favorite places to eat. I could get your own soup and pick and choose what to put on my salad. My sister and I got to have garlic bread. Best of all, my parents were in a good mood because we had a coupon and we could eat steak and all you could eat salad/soup. It would be at least 15 years until I'd even hear about or eat at Morton's or Ruth's Chris or Lawry's or BOA. To us, Sizzler = steak = good times. So to me, when I eat at a place like Chia Chia Steak, even though my tastebuds are a lot pickier and older, I can understand the popularity. An affordable night out for the family, with a sizzling steak for each person, plus a salad and ice cream buffet. Shrimp chips. Curly fusilli pasta. Corn. Even though the steak is bit chewy for me and I wonder why it's drenched in overpowering sauce that I end up scraping off, I see tons of happy kids and families chowing down and waiting in line for their seats. In this case, my grandma's friends wanted to take us to dinner. The menu is in English and Chinese and has different cuts of steak available, as well as lamb, pork and chicken- you can also order just the salad bar. Most of the sizzling plates are under NT$300 with the most expensive cut being the US Choice Sirloin at NT$450 (or about US$14). I hoped for the best after seeing the menu, plunged into the pasta and lettuce at the salad bar. I was strangely addicted to these UFOs (Unidentified Fried Objects)- I think they were squid? I had asked for mushroom sauce on my steak, but instead it came with a spicy pepper sauce sauce. I just scraped it off and tried it with the Chinese A1 steak sauce and ate the fried egg. I know that sizzling steaks on the cast-iron pans are popular in Taipei- I've had them before at the night market and food courts. And try the day glo ice cream at your own risk. It was artificial tasting and sugar sweet, but you know that's the kind of things that a kid loves, right? So Chia Chia Steak might be the Chinese Sizzler that some will remember fondly when they grow up. But if you're feeling nostalgic, there actually is a Sizzler in Taipei. I've been a looong time ago, when my uncle would treat us when we'd visit from the states, but I haven't been in at least 10 years. Where are the best sizzling steaks in Taipei? Kid friendliness: booth seating available. You know when you are introduced to a new place by someone, and you think, this is a really cool place with good food and good prices. But for some reason, you don't go back for a long time- probably it's a little off your usual path, you're too busy trying out new places, or just eating at home. And then one day, you're with a bunch of friends figuring out where to eat for lunch and you somehow think about that place and end up back there and wonder why you don't eat there more often. Well, in this case, my friends were craving sushi/sashimi and I went through my mental archives and cross refrenced it with my mental map, and beep, beep, beep, out came Sashi-Miya. Useful, huh? Haha. Sashi-Miya is an izakaya Japanese restaurant that has a little bit of everything- the extensive menu has a lot of small plates to be shared, including yakitori/kushiyaki (grilled skewers), sashimi, salads, noodles, baked/grilled/stirfried and sushi rolls (NT$60-NT$980+), as well as a full beer/cocktail/alcoholic drinks menu. The best thing about it is that it has really good prices for good Japanese food, the selection is huge and I liked almost everything that we tried. The menu not only has a picture for every single item, it also has English along with the Chinese. The first time I went, we sat on the second floor, so we could see how big the space is. Sashi-Miya is a converted old theater with three floors and a huge screen playing films or tv. There's various types of seating, tatami or regular, or along the sushi bar. I'm sure you could find secluded seating for a romantic date, or a large seating area for a rowdy group. From the second floor of the restaurant, you can get a nice view of the chefs busy below as well as the large screen (which is muted). My favorites: the sweet shrimp (NT$240) and uni (NT$320). And the tuna and avocado roll (NT$160). I could eat many of these. Okay, let me try and break down the abundant food we ordered from my two different visits. First, appetizers- get the agadashi tofu (NT$80) and avoid the cold tofu appetizer (NT$120). The agedashi was crispy and tasty, and the cold tofu was bland with a weird sesame sauce. The chilled tomato salad (NT$100) was also not bad (picked off the UGH raisins and sprouts) with a sweet plum sauce dressing. Onto the sushi and rolls. Rolls are harder to find in Taipei, but Sashi-Miya has some good ones. Futomaki combo,(NT$200) Unagi hand rolls, deep fried soft shell crab rolls, tuna avocado rolls and much more. They are a good size, unlike some other places that have good, but smaller rolls. And the huge platters of fresh sashimi. The sashimi is fresh and generous and beautifully presented and they have different sizes of combos. I think this is the L combo (NT$580) with a lot of sweet shrimp added to it. Did I mention how much I love uni? It melts on your tongue and it should be fresh and have a nice ocean, creamy, slightly sweet taste. You could hoard a whole order to yourself or be nice and share. Don't like your fish raw? They have a miso marinated cod that is nicely grilled. Gotta fit in the veggies too- I like kong ching tsai or Chinese watercress. My least favorite are the stir fried meats. I've had the stir fried beef and the stir fried chicken and wasn't crazy about either. Something about the flavors and the toughness of the meat- just didn't care for it. I also didn't care for the grilled shan yao (NT$220) which is a starchy tuber which texture is like a cross between daikon radish and taro. It's crunchy and a bit gooey and flavorless, but a favorite of my friend's family who brought us here. The menu is so varied that you could eat here multiple times and not get the same thing. Or perfect for that large group of friends to eat and share food with the festive atmosphere and roomy seating. As you can see, the Chinese name is different, so look for this sign or San Si Wei Wu. Sashi-Miya is not too far from the corner of Zhong Xiao and Fuxing. If you were coming from green Fuxing Sogo, you'd just walk straight ahead from the entrance, under the MRT subway and you'd spot it on your left. BTW- I enjoy making the maps to help people find the more out of the way restaurants, but somehow my maps keep getting messed with! I think Google Maps started consolidating user-created locations into 1 location, but only the Chinese address shows up and I do all my maps with English, and then I can't get the English to show, only the Chinese. I've also found some entries being "edited" by other users when added to their lists and it takes a lot of time to fix/redo the maps. Ugh. So FYI, that's why I haven't been keeping up with the maps. Don't know why Google allows you to edit other people's entries. It's annoying. Primo Trattoria is the kind of place that I could imagine stopping by for lunch or dinner more often if I lived in walking distance. An elegant Italian restaurant serving appetizers, pizzas and pastas as well as a deli counter that you can take home imported cheeses, pastas and wines. The modern, white space is nice enough to have a romantic night out or a large group celebration, yet not too stuffy to have a casual dinner out. The restaurant is split into two sections which can see each other through the glass windows, a semi-open kitchen in the center and a private room in the back. The lunch specials are an affordable NT$260-$340 with a range of pastas and pizzas and come with soup, salad and coffee or tea. That day we could choose between six different pastas like the Spaghetti alla Vongole or Penne alla Carbonara e Limone or a penne pasta with cream sauce and egg yolk with shrimp and asparagus or 4 different pizzas. My favorite dish was the tripe in spicy tomato sauce with Primo bread (NT$340). The bread was made from the same dough as the pizza and was a wonderfully chewy sponge to soak up the spicy sauce. We liked it so much we asked for more bread, but got regular side bread instead- I guess we should have asked for Primo bread. The Zuppa del Giorno soup of the day and Insalata di cesare caesar salad were light and made with fresh ingredients. They have parmesan that they shave for the salads. We also tried a few of their appetizers- the bruschetta and caprese. The portions are perfect for one person or a couple. The toast for the bruschetta (NT$100) was slightly burnt and flavors of the tomatoes were not as robust as I would have liked. The mozzarella for the caprese (NT$120) wasn't as milky as I'd had before and the tomatoes not as sweet- but I did like the arugula to add a layer of sharpness. After the appetizers, my friends and I agreed that we preferred Macaroni Grill's. But the pizzas... the pizzas were a hit. If you aren't avoiding carbs, then you'll happily devour the chewy crusts, which rises above the rest of the thin crust pizza topped with fresh ingredients. Our Pizza Genovese (NT$300 for set lunch) had pesto sauce, mixed cheese and sliced mixed mushrooms. The lunch special pizzas are smaller than their regular pizzas, but still large enough to share. On my second visit, we got the recommended Fiorentina pizza (NT$360) which has a soft cooked egg in the center of spinach, bacon, garlic and cheese topped pizza. The egg is put on the pizza after it's taken out of the oven and breaks when the pizza is sliced. My friends and I were a bit nervous about eating a practically raw egg and asked if they could put the egg on a little earlier. I think they obliged, but the egg was still far from being done. But it mixes in with the flavors of the pizza and provides a unique (though runny) layer to the pizza. Definitely give this a try if you want to try something different. On my second visit, I gave a different set of appetizers a try. The Proscuitto di Parma (NT$360) was pretty classic, and the Fritto Misto (NT$200) was a lot smaller than I expected it would be, with one shrimp and a couple of calamari rings. The Spaghetti alla Pescatora (NT$400) is probably a better bet if you are looking for seafood with al dente spaghetti. At the end of the meal, you have the dessert tray to ooh and aah over, which includes tiramisu. panna cotta, gouda cheesecake or puddino bianco. One of their specialties is a freshly made Mascarpone Dolce (NT$100) which is fresh mascarpone cheese with raisins mixed in. Ugh- I wish they offered something else, chocolate chips or something along those lines, to mix in because I loathe raisins. So we settled on the panna cotta (NT$120) topped with berries which was a nice way to end the meal. Just look for the Primo signs with the Disney-esque lettering if you want to go. Reservations are also recommended as the restaurant were very full both times I went.